Ea O Ka Aina: 2nd Crash Approaching? SUBHEAD: Twenty early warning signs that we are approaching a global economic meltdown. 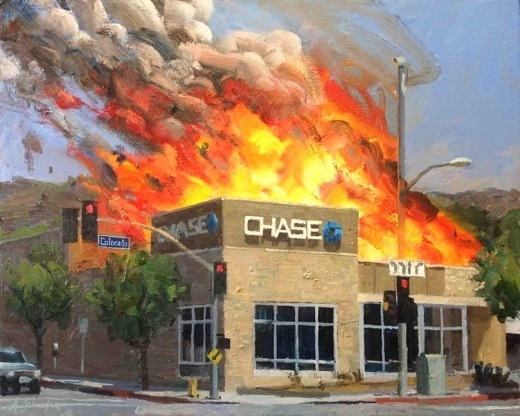 Image above: Painting by Alex Scahefer of Chase bank burning on Main Street, USA. From (http://www.laweekly.com/informer/2011/09/07/banks-on-fire-paintings-by-artist-alex-schaefer-inspire-lapd-concern-now-collectors-willing-to-pay-thousands). Have you been paying attention to what has been happening in Argentina, Venezuela, Brazil, Ukraine, Turkey and China? If you are like most Americans, you have not been. Most Americans don't seem to really care too much about what is happening in the rest of the world, but they should. In major cities all over the globe right now, there is looting, violence, shortages of basic supplies, and runs on the banks. We are not at a "global crisis" stage yet, but things are getting worse with each passing day. At one point last month, the 37-year-old shop owner refused to open the metal shutters protecting her corner grocery in downtown Buenos Aires more than a few inches -- just enough to sell soda to passersby on a sweltering summer day. #5 Brazilian stocks declined sharply on Thursday. [IB note: Friday the Dow tumbled 318 points. Dow futures are down 335 points as of 1/25]. There is a tremendous amount of concern that the economic meltdown that is happening in Argentina is going to spill over into Brazil. As China's CNR reports, depositors in some of Yancheng City's largest farmers' co-operative mutual fund societies ("banks") have been unable to withdraw "hundreds of millions" in deposits in the last few weeks. "Everyone wants to borrow and no one wants to save," warned one 'salesperson', "and loan repayments are difficult to recover." There is "no money" and the doors are locked. #8 Art Cashin of UBS is warning that credit markets in China "may be broken". For much more on this, please see my recent article entitled "The $23 Trillion Credit Bubble In China Is Starting To Collapse – Global Financial Crisis Next?" Wall Street was rattled by a key reading on China's manufacturing which dropped below the key 50 level in January, according to HSBC. A reading below 50 on the HSBC flash manufacturing PMI suggests economic contraction. #17 CNBC is reporting that U.S. retailers just experienced "the worst holiday season since 2008". #20 The Dow fell by more than 170 points on Thursday. It is becoming increasingly likely that "the peak of the market" is now in the rear view mirror. In light of everything above, is there anyone out there that still wants to claim that "everything is going to be okay" for the global economy? A great economic storm is rapidly approaching, and most people don't even seem to notice the storm clouds that are gathering on the horizon.